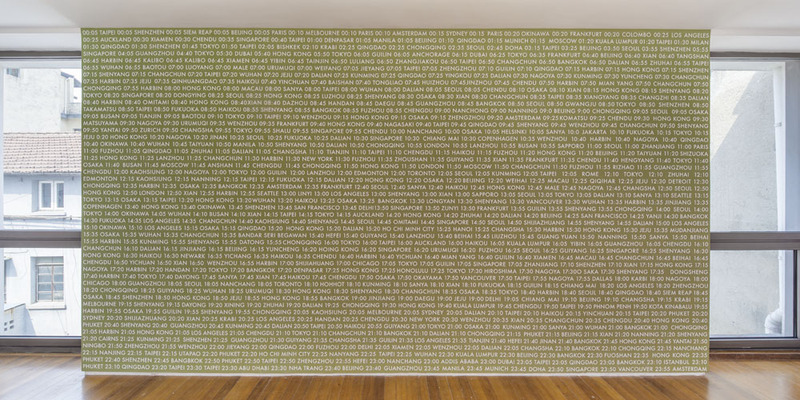 The title of the exhibition is taken from American author Mark Twain’s novel “The Gilded Age – A Tale of Today” (1874). While the novel illuminated the superficiality that obscured social problems in the ‘gilded age’, Michael Lin projects a vivid ideology of ‘gild’ onto the cosmopolitanisms of the current era by way of dissecting a single day in our own time. Through the study of transportation and mobilities, he extends his critique to contemporary economic flows and urban circulations. 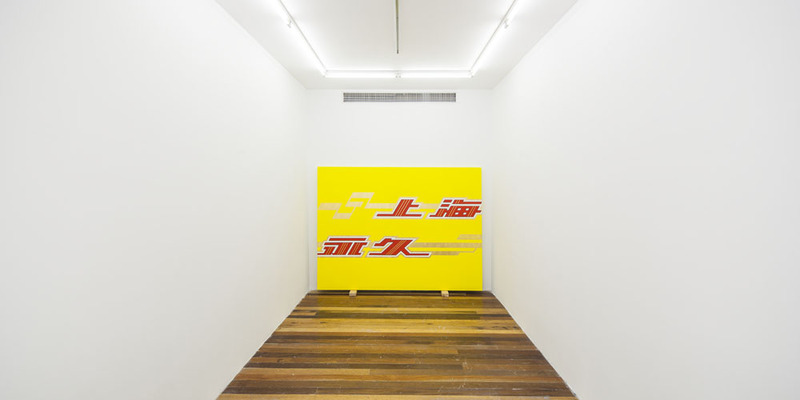 Since moving to Shanghai from Europe in 2006, the unique composition and experiences of Shanghai urban life have offered Michael Lin the inspirations for several consecutive exhibitions and research projects. 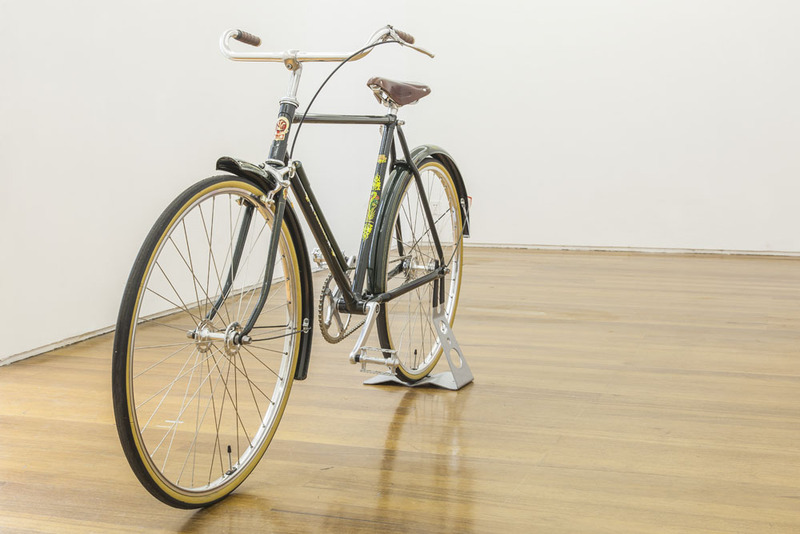 During the past 10 years, bikes have been the go-to transportation method by the artist, but more importantly, the image of bikes have appeared frequently in Lin’s works as subjects. 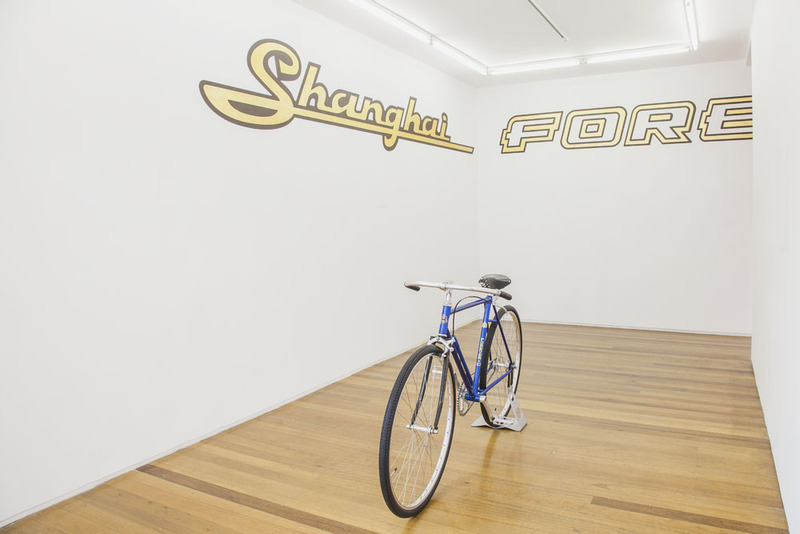 After studying the bikes as a transportation method as well as a subject of paintings, Lin has decided to appropriate one of the most important brands of bikes in Shanghai, which is “FOREVER”- there are also bikes of the brand “Phoenix”in the exibition – as case study. By studying the bike bodies, brand image, and text, the history of bike culture emerges: starting as a symbol of economy and social prosperity, to a state of temporary recession, only to revive again in recent years as a result of a hip lifestyle promoted by the local youth and foreign residents under the context of environmental sustainity and urban planning.While the imagery of bike wheels is a portrait of modern Chinese cities, bikes have also become the preferred transportation method in Europe as a result of urban planning. The dialogue between the two contexts have amplified the humanities of reformation and change brought by bikes. Throughout the exhibition there are wall paintings, one of the most known pratices of the artist. 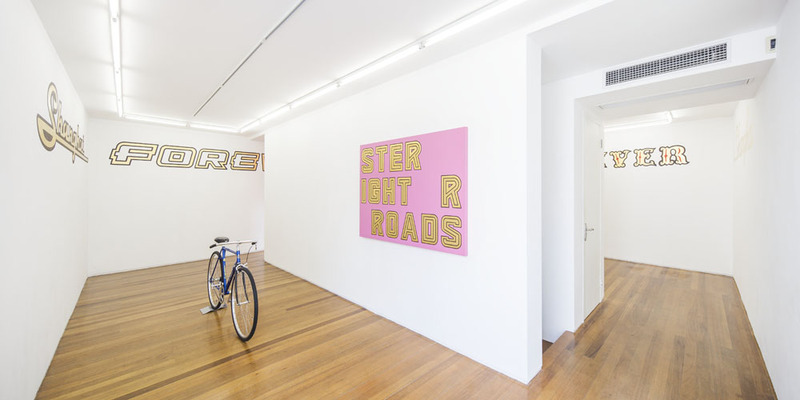 In these murals there are enlarged texts and images appropriated from classic design and typology of “FOREVER” bikes. 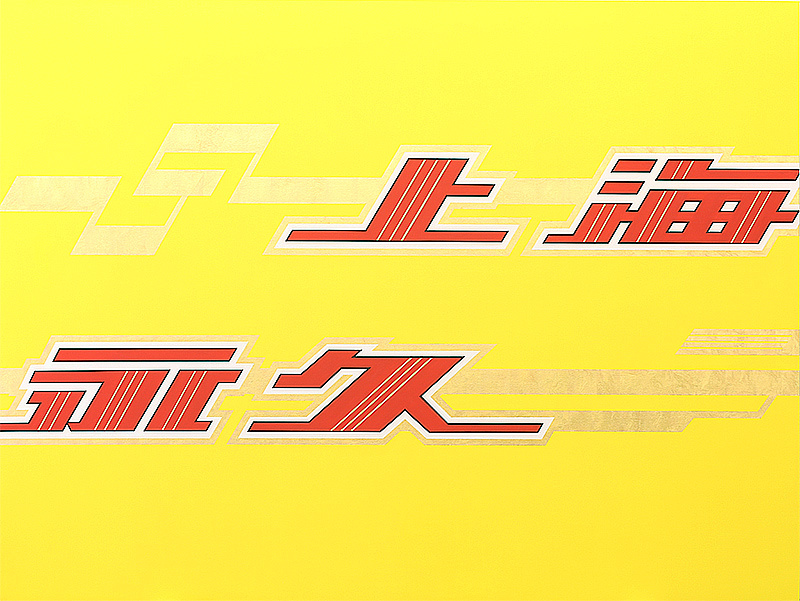 Founded in 1940, it is one of the most famous Chinese bike brands, or even the most classic Chinese brand in general. The story of its production, design and export history is almost a microcosm of China in the 20th century. Its trademark for export “Forever” is embodied with special typology design(calligraphy) of the time. 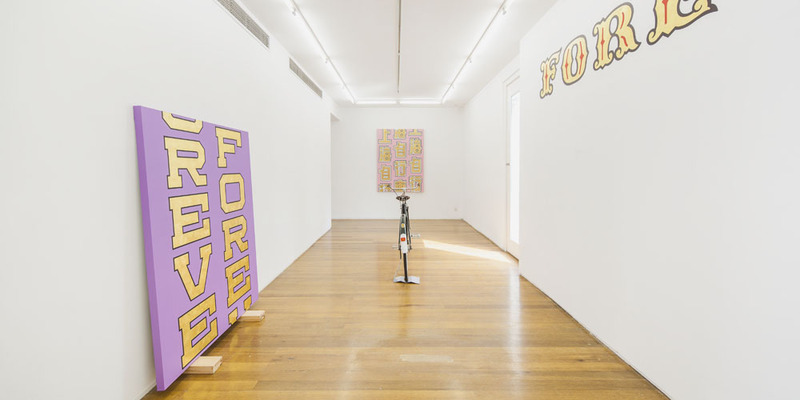 Throughout the 3 floors of the gallery, the repetively appearring texts and symbols do not merely recall the city and spirit during the peak time of the brand, but also a reconstruction of the imageries of future cities buried under collective memory. Responding to the murals are a series of paintings on canvas. 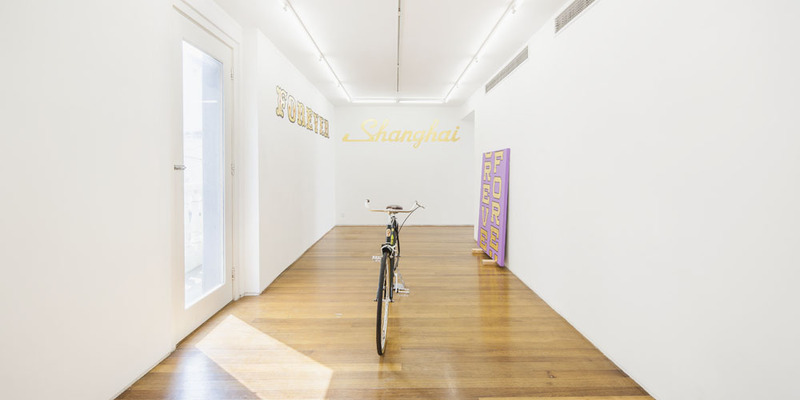 By deconstructing and recomposing the trademark of “FOREVER” and the texts on the body of the bikes, it also provides more context and reading of urban transportation and communications.The big scale painting leaning on the wall in the back room on the first floor is like a giant propoganda poster, on which heavy calligraphy of “FOREVER” and “SHANGHAI” are incorporated into a calling of the time. 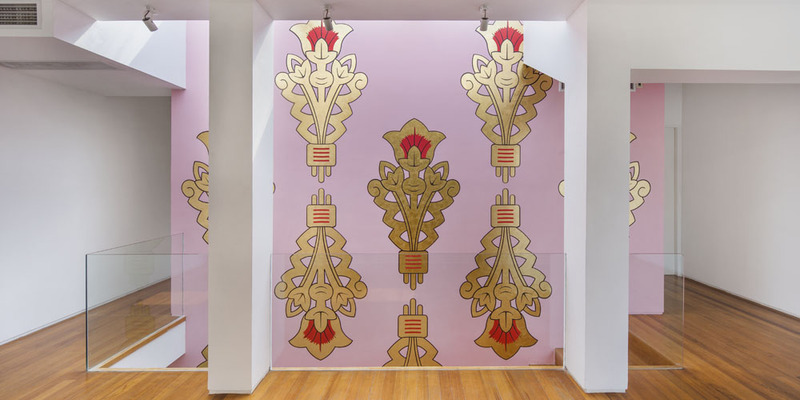 The application of gold leaves on both the murals and painting on canvas assenuate the texture of industrial design both physically and metaphorically, sealing the deal of “The Gilded Age”. 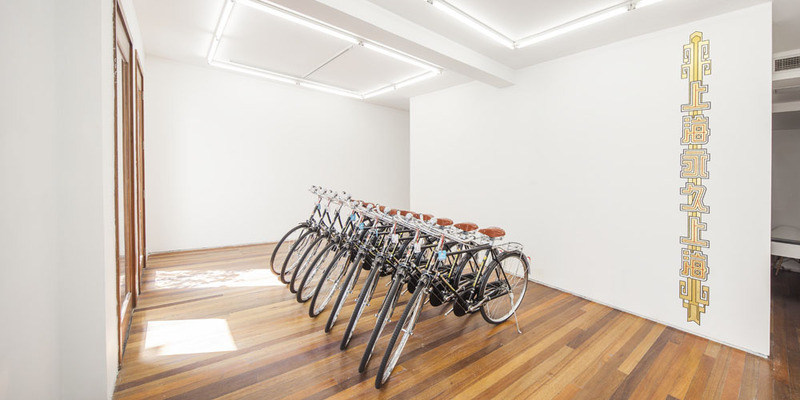 In the exhibition, bikes are installed in various forms. Nine black bikes on the first floor constitutes a parking lot, or a small scale bike shop,both of which have been a common scene in the city memory of Shanghai in the past 10 years, responding to the golden text mural on the back“SHANGHAI FOREVER SHANG”, which is composed of trademark patterns. 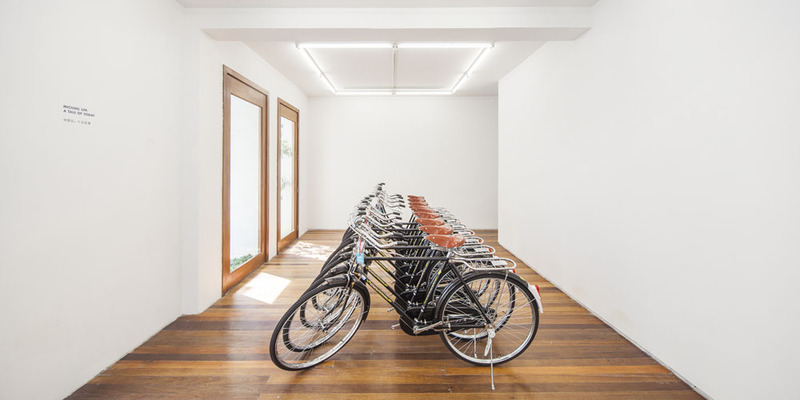 In the two rooms on the second floor, the custom designed bikes are hand made by the artist, praising the material and the aethetics. The time and destination of flights leaving Pudong, Shanghai in one day unfolds on the wall of the third floor through mechanic writing, which is the last chapter of A TALE OF TODAY. This cold and constant data, opposite to intimate experiences of bike culture, surveys the extremity of mobility in urban life by marking out terrirory existing in the form of time and locations. World renowned artist Michael Lin (b. 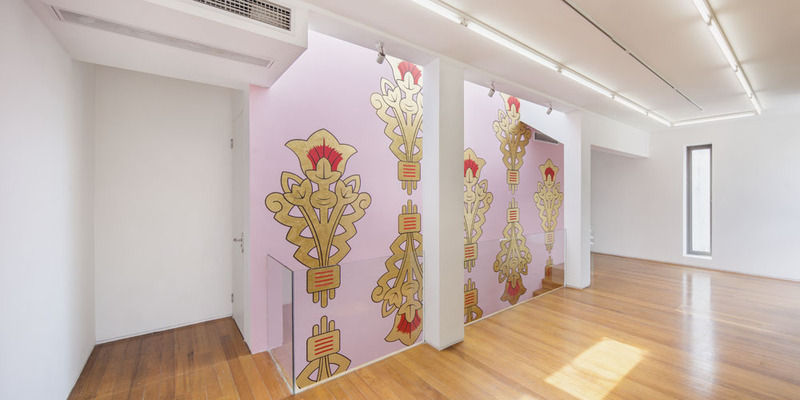 1964, Tokyo, now lives and works in Shanghai and Brussels) is famous for his large scale murals and installations, which might have changed or reconstructed the meaning of public space and traditional painting. 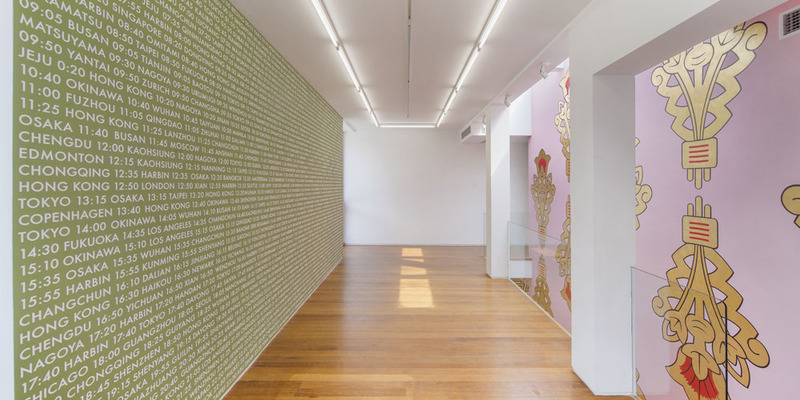 In recent years, Lin has expanded its practices to broader realms of architecture and city space, discussing the new mode of contemporary life and mobility. His recent museum solo shows include but are not limited to: MCAD Museum, Manila, Philippines; High Museum of Art, Atlanta, USA; SCAD Museum, Savannah, USA; PEM Peabody Essex Museum, Massachusetts, USA; Rockbund Art Museum, Shanghai, China; Tawada Art Center, Tawada, Japan; MARCO, Vigo Museum of Contemporary Art, Vigo, Spain; Vancouver Art Gallery, Vancouver, Canada; Luigi Pecci, Prato, Italy, and etc. 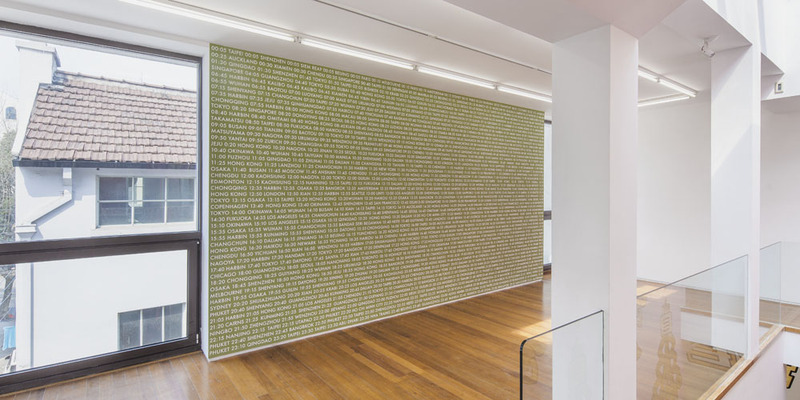 Besides, Michael Lin’s works have been featured in various biennales and museum group shows, such as: “M HOME: Living in Space RedStar Macalline Art Project”, Ullens Centre of Contemporary Art, Beijing, China，2014; “Memories of the Future”, Leeum, Samsung Museum of Art, Seoul, Korea, 2009; Live and Let Live: Creators of Tomorrow, Fukuoka Asian Art Triennial, Japan, 2009; The Spectacle of the Everyday, Lyon Biennial, Lyon, France,2009；Notre Histoire, Palais de Tokyo, Paris, France, 2006; Polyphony, 21st Century Museum of Contemporary Art, Kanazawa, Japan, 2004; International 2002, Liverpool Biennial, Liverpool, United Kingdom, 2002; Pause, Gwangju Bienial, Gwangju Biennial Hall, Gwangju, Korea, 2002; Urgent Painting, Musee d’Art Moderne de la Ville de Paris, France, 2002 ; 49TH Biennial of Venice, Taiwan Pavilion, Venice, Italy. Published on March 12, 2016 4:07 pm.